I’m a true believer that life is always better with dessert first. There’s something to be said to starting on a sweet note. 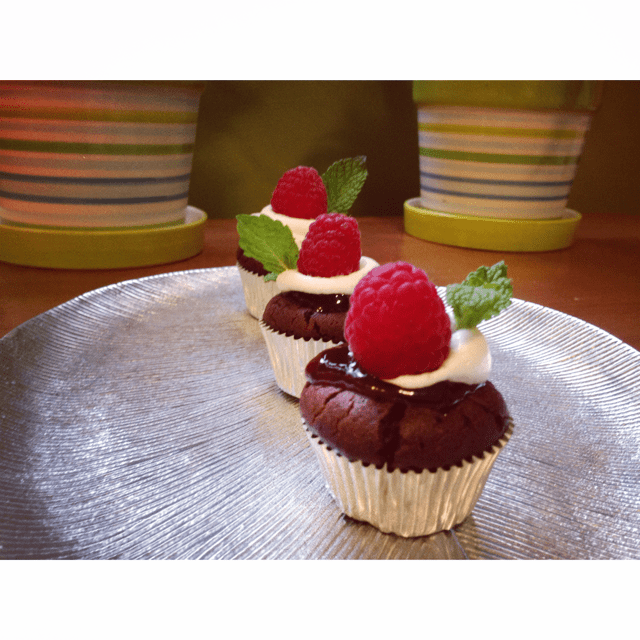 So with that my first blog post is born, and we will start off with two of my favorite things chocolate and raspberries in these Flourless Chocolate Cupcakes. About a year and a half ago I decided to make the move to Gluten free. Ok ok limited gluten cause lets face it sometimes a girls just gotta have Pizza! For me it wasn’t about jumping on the “oh no gluten is evil” band wagon, but I found without it in my life my migraines decreased significantly, I wasn’t sluggish and my body simply felt better. With that being said I threw my mothers holiday world upside down, and sideways. On her hunt to find an delicious, and appealing looking holiday dessert that would appease me, and still not throw a wrench into the holiday mix she stumbled upon this winner. WINNER INDEED! I know your thinking Gluten free yuck! Just wait it gets better its low in sugar, and can be made dairy free too! I’m sure I just lost a few of you after that last sentence. Trust me I was hesitant at first too when she told me about this, but if I have learned anything over the years it’s that momma typically knows best. While I am getting everything ready I set the oven to preheat at 350 degrees. 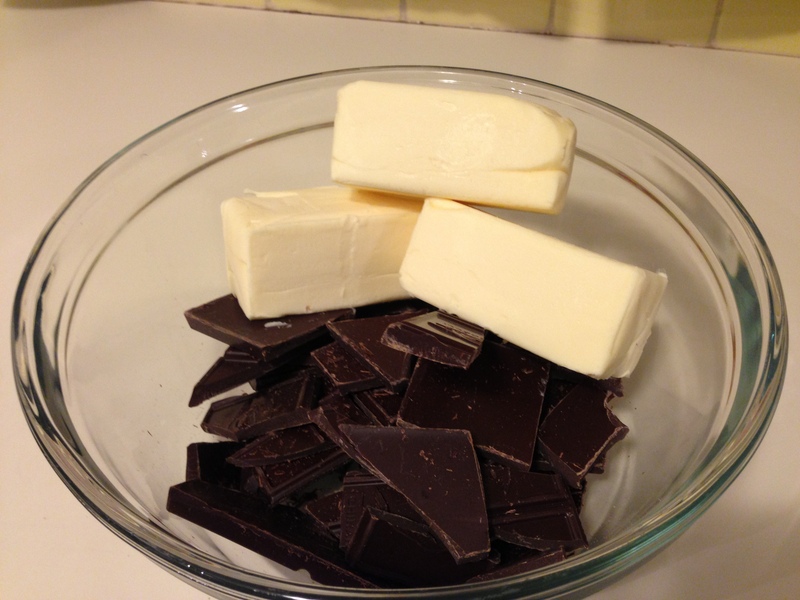 Then in microwave safe bowl melt butter and chocolate on High for 30 second intervals stirring between each interval until all melted and smooth. Next stir in the coffee crystals. Let the mixture cool to room temp. (About 15 minutes). Interesting tidbit of info Coffee actually brings out the flavors in chocolate. When you bake enough chocolate cakes, or simply look at enough chocolate cake recipes, you’ll notice a trend: many of them include coffee or instant coffee as an ingredient. This isn’t because most people are looking for a mocha-flavored cake. Rather, coffee is commonly included because it is a great way to enhance the flavor of cocoa powder, resulting in a more chocolaty cake – not a coffee-flavored one. Meanwhile, line cupcake tins with foil cupcake liners. (about 18 cupcakes) If you don’t have foil cupcake liners the regular paper ones will work in a pinch but foil ones will make the eating process easier. 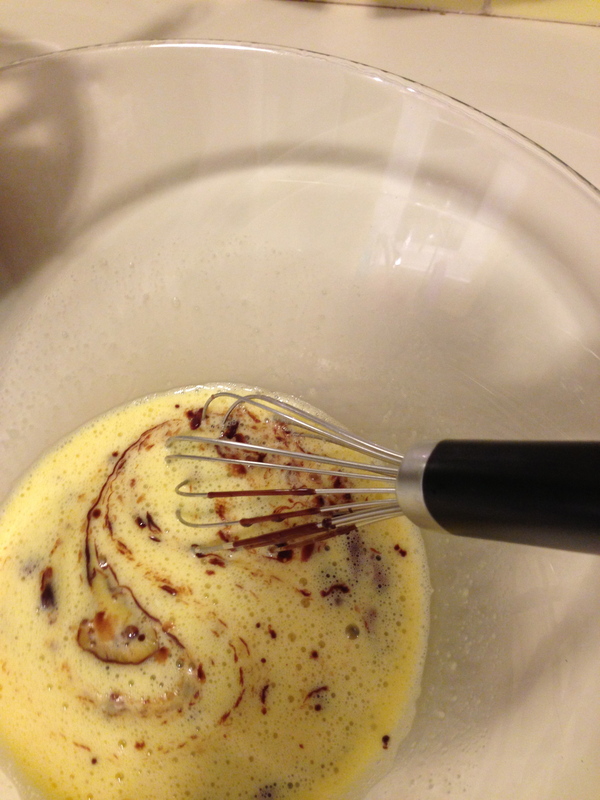 Next in a large bowl, whisk together eggs, sugar, and vanilla until well blended. 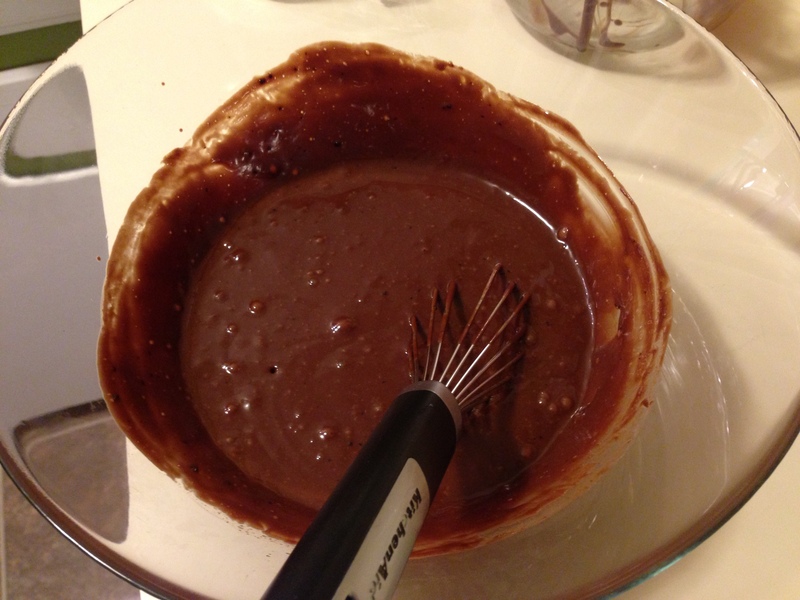 Now whisk in the cooled chocolate mixture into the egg mixture until well combined. 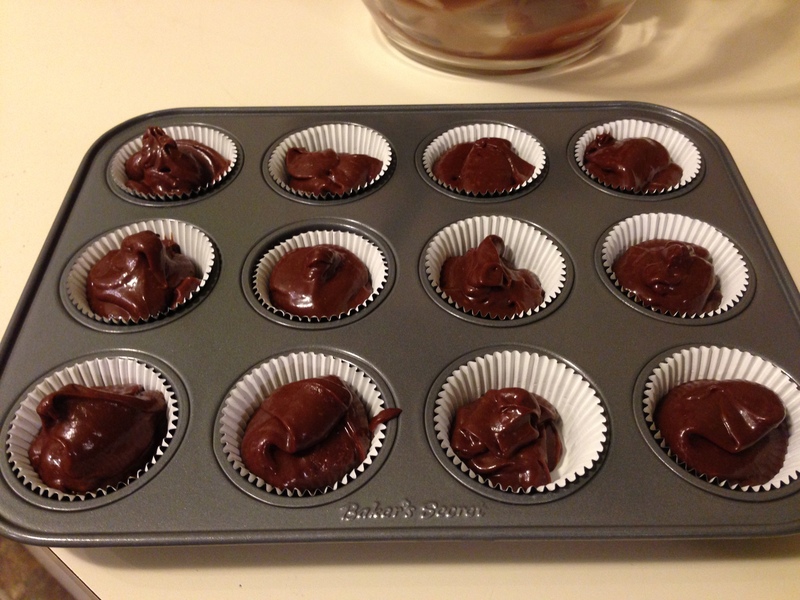 Evenly divide the batter into the lined cupcake tins. (The batter is very thin and it doesn’t rise to much, so you can fill them almost all the way up to the rim of the liner). Bake for 25 minutes or until the center jiggles slightly(they will fall as soon as they start to cool so don’t panic). Once they are completely cool that con-caved part in the middle is perfect for the raspberry jam! Cool in the pans on racks then refrigerate over night or for at least 8 hours. When ready to serve, gently remove the foil liners (I left them in the liners easier to grab that way). Spoon the raspberry or Strawberry jam into the well on the top of the cupcake. I use the local store brand when I don’t have time to make homemade. (approx. 1 tsp). Next place a bit of non-dairy whipped topping or better yet real whipped cream. then garnish with a fresh raspberry and mint leaf. Place on plate and garish with berries of your choice. This entry was posted in Dessert and tagged Chocolate, Chocolate Lovers, Cupcake, Cupcakes, Dairy Free, Dessert, Flourless, Gluten Free, Low Sugar, Raspberry.